Integrated Border Management is mostly mandated by India’s security concerns and therefore it became necessary to install a collection of systems and sub-systems which address these concerns while also facilitating trade and commerce across the border. There are several designated entry and exit points on the international borders of the country through which cross border movement of persons, goods and traffic takes place. Existing infrastructure for discharge of various sovereign functions at these points are neither adequate or integrated nor coordinated and no single agency is responsible for coordination of various Government functions and services at these points. The ICPs are envisaged to provide all the facilities required for discharge of sovereign and non-sovereign functions to enable smooth cross-border movement of individuals, vehicles and goods under an integrated complex. These would facilitate the processes of immigration, customs, security, quarantine, etc. As a response to the situation of inadequate infrastructure for cross border movement of persons, vehicles and goods, various meetings of the Committee of Secretaries discussed the situation since October, 2003 and recommended to set up Integrated Check Posts (ICPs) at major entry points on our land borders. These ICPs would house all regulatory agencies like Immigration, Customs, Border Security, Quarantine etc., along with support facilities in a single complex equipped with all modern amenities. The composition and constitution of an autonomous agency, for construction, management and maintenance of the ICPs to be set up under the overall charge of the Department of Border Management was also considered. In 2004, the Committee of Secretaries directed the Deptt. of Border Management, M/o Home Affairs to set up an Inter-ministerial Working Group (IMWG) comprising representatives of the NSCS, MEA, Ministries of Commerce, Road Transport and Highways, Department of Revenue, Ministry of Finance, IB, SSB and State Governments to consider the creation of an autonomous agency to oversee the construction, management and maintenance of the proposed ICPs. Department of Revenue, Ministry of Commerce, SSB, NSCS, IB and Governments of Bihar and UP in the Department of Border Management. The Committee of Secretaries approved the approach suggested. While developing the project for ICPs in accordance with the CCS approval, it became apparent that the PPP Model would not be practical or feasible at this stage. Subsequently, the issue was considered by the Cabinet Committee on Economic Affairs (CCEA) in its meeting on November 6, 2008. The CCEA noted that the procedures related to the PPP Model required substantial time for completion and there might be concerns about how sovereign functions on strategically sensitive borders may be implemented in the PPP Model. Therefore, the CCEA approved the construction of ICPs with government funding, while enabling/authorising the ESC/LPAI to assign non-sovereign functions for development/management in the private sector. 13 ICPs were approved ‘in principle’ for construction initially. The CCEA also approved to incur expenditure amounting to Rs.635 crore, to set-up the ICPs, inclusive of Rs. 57 crore for expenditure on acquisition of land for ICPs other than at Attari/Wagah, Raxaul, Moreh and Petrapole whose project cost was approved, as a Plan Scheme under the 11th Five Year Plan as given in the Table at Para 10. The ESC was also empowered to change the inter se priority of the ICPs as also to approve project cost upto Rs.100 crores. 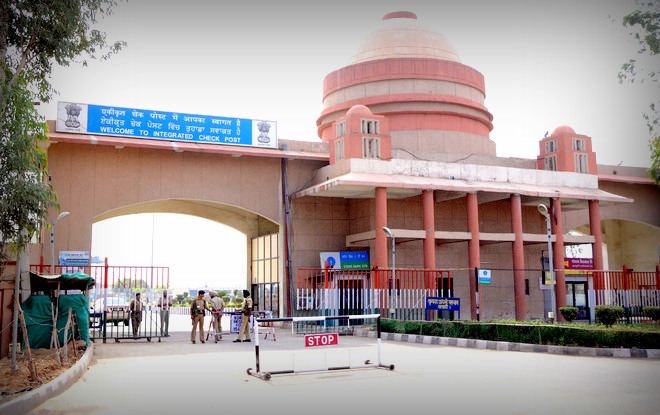 The Land Ports Authority of India (LPAI) has been set up as a statutory body to function as a body corporate under the administrative control of the Department of Border Management, Ministry of Home Affairs, to provide better administration and cohesive management of entry points/land ports on the land borders and would be vested with the powers on the lines of similar bodies like Airports Authority of India. The LPAI Bill received the assent of the President after its passage in both Houses of Parliament. The Land Ports Authority of India Act, 2010 was notified in the Official Gazette on 1st September, 2010. The Rules under the Act have been framed and was notified in the Official Gazette on July 7, 2011. LPAI has been established w.e.f March 3, 2012 and started functioning.